The U.S. House has reversed itself and given final approval to a giant economic bailout bill. The measure — revised, re-framed and expanded — passed comfortably by a vote of 263 to 171. It attracted 26 more Republicans and 32 more Democrats than last Monday night. 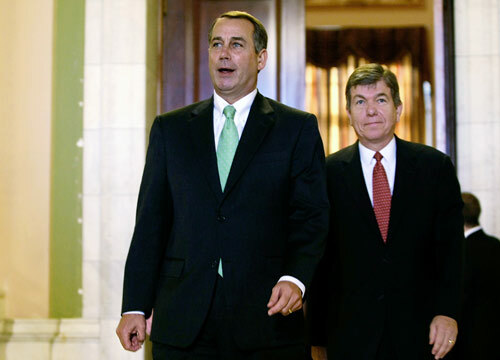 House Minority Leader John Boehner (left) and Minority Whip Roy Blunt emerge from a House Republican meeting on the financial bailout package Friday. President Bush signed a $700 billion financial bailout package Friday, shortly after the U.S. House passed the rescue measure, in a vote of 263-171. The action paved the way for the government to start buying up troubled assets from financial institutions caught on the wrong side of record home foreclosures. "I know some Americans have reservations about this legislation. ... In this situation, action is clearly necessary, and ultimately the cost to taxpayers will be far less than the initial outlay," the president said after the House action. He said it would take some time for the legislation to have its full effect on the economy. "There were moments this week when some thought that the federal government could not rise to the challenge. But thanks to the hard work of members of both parties, in both houses, and the spirit of cooperation between Capitol Hill and my administration, we completed this bill in a timely manner," he said in remarks in the Rose Garden. 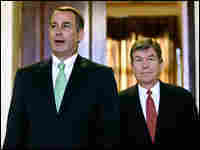 The House had rejected a similar bill on Monday, causing the Dow Jones industrial average to plummet almost 800 points. The Senate approved a revised version earlier this week, sending it back to the House for another try. For more than a week, investor sentiment has been revolving around the twin suns of Capitol Hill and Wall Street. Investors had already factored the vote into share prices, and that's part of the reason the stock market moved sideways after the vote. The Dow had been up about 200 points Friday morning but began a slide after the vote, with investors apparently showing concern that the economy is still in for a rough ride. The Dow was down by 157 points at the close of trading. Analysts say investors are assuming a recession is in the offing and expect the Federal Reserve to lower interest rates to blunt that downturn. The 450-page bill gives the government the unprecedented authority to buy troubled assets on Wall Street's balance sheets. It contains provisions favored by House Republicans, including $149 billion in tax breaks, a higher limit on federal bank deposit insurance and changes in securities law. It also restates securities regulators' authority to suspend asset-valuing rules that corporate executives blame for fueling the crisis. The Senate approved the bill Wednesday, 74-25. Rep. Michele Bachmann (R-MN) voted against the bill. Treasury Secretary Henry Paulson "pulled the fire alarm and cried fire, fire from the roof," she said on CNBC shortly before the vote. The Senate's version of the bailout bill is nothing more than a dressed-up version of what she voted against Monday, Bachmann said. "This doesn't address the fundamental problem of the credit crisis," she said. "Coming down the road for the next few years, we may rue the day that this passed." The credit markets have been nonplused by all of this activity in Washington. Banks that have cash aren't lending it. The cost of borrowing dollars in London has been rising and shows little sign of easing. The London Interbank Offer Rate is considered a good barometer of how much banks trust — or don't trust — each other. And right now banks have determined they aren't willing to risk lending out their cash because they might not get it back. Their wariness is not misplaced. European and U.S. governments have had to rescue five banks in the past week alone. Because of the tight lending conditions, banks and institutional firms are going to the Fed to get cash. Commercial banks averaged $44.5 billion in daily borrowing over the past week — up from a little more than $39 billion a week earlier, the central reported Thursday. California Gov. Arnold Schwarzenegger told U.S. Treasury Secretary Henry Paulson in a letter Thursday that the state may need to turn to the federal government for short-term borrowing if conditions in the credit market don't improve soon. California usually borrows money this time of year to pay for the state's basic operating expenses and then repays the loans after tax revenues begin pouring in the following spring. "Absent a clear resolution to this financial crisis that restores confidence and liquidity to the credit markets, California and other states may be unable to obtain the necessary level of financing to maintain government operations and may be forced to turn to the Federal Treasury for short-term financing," the governor wrote. Investment firms are facing the same dilemma. They drew almost $148 billion for the week ended Wednesday, compared with just $88 billion the previous week. Commercial banks often go to the Fed to get loan privileges so they can cover their reserve requirements. Back in March, as it scrambled to avoid a market meltdown, the Fed gave investment houses permission to do that, too. This is the broadest use of the central bank's lending power since the Great Depression. While watching the unfolding events in the House, investors are having to digest a litany of doomcasting reports that seem to indicate the economy is headed for recession. The Labor Department said employers slashed 159,000 jobs from their payrolls in September, the most in five years. That news comes on the heels of two other gloomy reports Thursday: Weekly jobless claims reached a seven-year high, and factory orders fell 4 percent in August, a full percentage point worse than economists had forecast. Adding insult to injury, the Mortgage Bankers Association said U.S. foreclosures in the second quarter rose to a record 2.75 percent of all mortgages issued that quarter. Investors are also focusing on how the U.S. Treasury is going to administer the program. Analysts said that until the Treasury explains how it will buy and sell the toxic debt, the nervousness will continue. "Once the legislation is signed, we're going to be going out and lining up some advisers from the private sector," Paulson told reporters. "There are a wide variety of tools that we have that come with this legislation, and which combined with the other authorities we have ... are going to be very important in protecting the stability of the financial markets, which ultimately protect the economic security of the American people." Indeed, the Treasury will have to walk a fine line. On one hand, there is concern that the Treasury will buy the debt at such bargain-basement prices that it will hurt the banks rather than help them. Or, if the Treasury just gives the banks the price that the market would give them right now, it raises the question of why the government needs to be involved in the first place. What seems clear is that the rules governing the financial industry will be under scrutiny when the new Congress returns next year. "Starting in January ... we have to rewrite how to finance in America," House Financial Services Committee Chairman Barney Frank (D-MA) said after the vote. "It would be highly irresponsible, a betrayal of our oath to stop here. ... Now we have to perform more serious reform and it will be our job to enact a set of regulations for all of the financial industry."